Many Filipino kids dream of having their birthday party at Jollibee. They want to celebrate with Jollibee and friends and they want to enjoy their special day eating their favorite Jollibee meals. I guess that many Filipino moms and dads want to make the Jollibee party dream of their kids come true. Well, if you are one of those mommies or daddies then I believe that this latest Jollibee birthday party package brochure is a must read for you. The party brochure features the newest Jollibee party theme, which is the JolliRace. 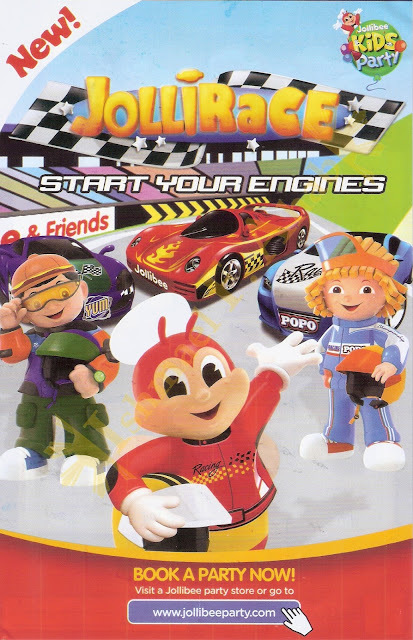 I believe that this Jollibee party theme is perfect for young kids (be it boy or girl) who like to watch car racing. In fact, I believe that my 2-year old Samuel will like this Jollibee party theme because he likes cars, particularly monster trucks. 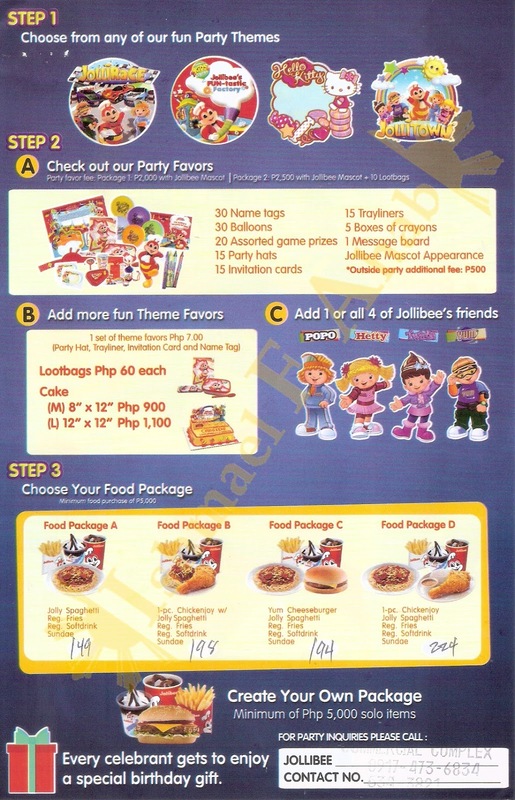 The back of the Jollibee birthday party package brochure shows the 3 easy steps in booking a Jollibee party. Let us talk about these steps one by one. You can choose from the following four Jollibee party themes: JolliRace, Jollibee’s FUN-tastic Factory, Hello Kitty, Jollitown. My 1-year old Samantha will definitely like the Hello Kitty Jollibee party theme. 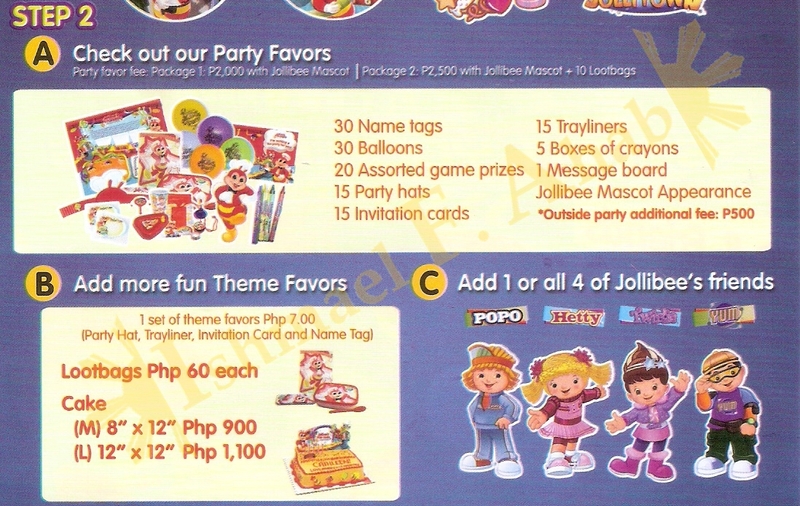 You can select from two Jollibee Party Favor packages. Package 1 has one Jollibee mascot appearance and cost 2,000 pesos. Package 2 has one Jollibee mascot appearance plus 10 lootbags and cost 2,500 pesos. 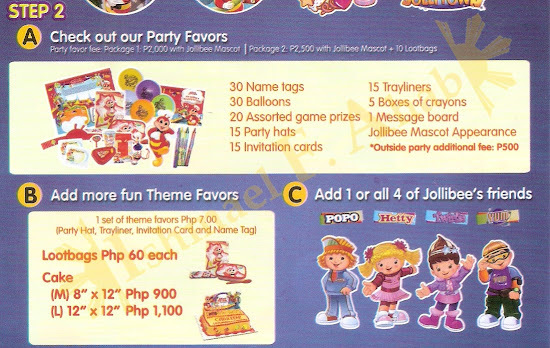 The Jollibee party favors are the following: name tags, balloons, game prizes, party hats, invitation cards, tray liners, boxes of crayons, and message board. You can also add additional loot bags, birthday cake from Red Ribbon, and other mascots. Jollibee Party Food Package A – composed of Jolly Spaghetti, regular fries, regular softdrinks, and sundae. Jollibee Party Food Package B – composed of 1 piece Chicken Joy with Jolly Spaghetti, regular fries, regular softdrinks, and sundae. Jollibee Party Food Package C – composed of Yum Cheeseburger, Jolly Spaghetti, regular fries, regular softdrinks, and sundae. 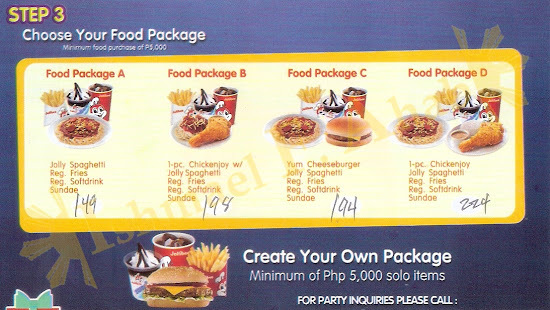 Jollibee Party Food Package D – composed of 1 piece Chicken Joy, Jolly Spaghetti, regular fries, regular softdrinks, and sundae. You can also create your own Jollibee party food package for a minimum of 5,000 pesos. These are the easy steps in preparing your child’s Jollibee party. So, I suggest that you take hold of the brochure that I posted here and plan that birthday party.